Take a large microwave safe bowl and add the chopped apples. Pop the bowl in the microwave on for 3 mins and allow to cool. Grind the apples with little milk. Add this ground apple puree to a large microwave safe mixing bowl. 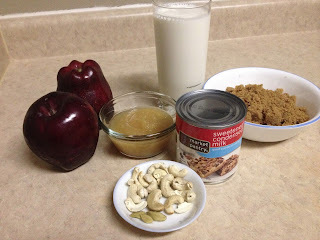 Add apple sauce, milk, condensed milk and sugar to the pureed apples in the bowl and mix well. Microwave on HIGH for 7 minutes. Take the bowl from microwave and add cardamom powder. Place the bowl back in to the microwave and cook for another 3 to 4 minutes. By now, the milk should have thickened to a kheer consistency. If the mixture is not thick enough pop the bowl back in the microwave and cook for another 2 to 3 minutes. Take the bowl out of the microwave and set aside. In a small microwave safe bowl, add butter and cashews and microwave it for 1 to 2 minutes till the cashews are roasted to light golden brown color. Add the cashews along with ghee to the kheer. This dish can be served hot but for me I like it chilled. If you like it chilled, let the kheer come to room temperature and then pop it in the refrigerator for couple of hours before serving. 1. You can always garnish the kheer with saffaron strands for extra color and look. 2. You can add raisins along with cashews. 3. Brown sugar can be substituted with jaggery. If using jaggery, melt the jaggery separately in another bowl, run it through a sieve to get rid of any impurities and then add to the pureed apple mixture. 4. Apple sauce is optional. You can leave that ingredient out completely if you do not have it on hand. But I find adding apple sauce helps in getting the thick consistency.